The Bricklayers Arms Pub is approximately 150 years old and situated in the beautiful Surrey village of Shamley Green. The village is part of the Surrey Hills Area of Outstanding Natural Beauty between Wonersh and Cranleigh. The current Landlord and Landlady, Carl and Paula, took over the lease of the Bricklayers Arms from Ted & Debbie in Sept 2006. Since that time they have built the food reputation up to a high standard and Carl is very attentive when looking after his beers. With 5 real ales always available, some local and some not, along with various ciders and four lagers on draught, they attract customers from afar as well as looking after the locals who fondly refer to the pub as the Brickies. Many years ago it was referred to as The Top House and still is by some of their older regulars. In the time they have been at the Brickies they have got married. 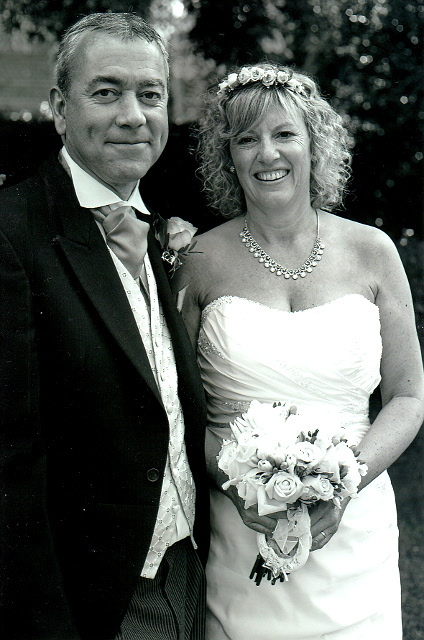 After 17 years together Carl popped the question on Christmas Day 2012 and they were married in Shamley Green's picturesque Christ Church, by Rev Sally Davies on July 5th 2013. The sun shone that day and a friend and neighbour, to the church and to the pub, Rob Bowbrick, provided his garden for the reception. Both Carl and Paula are very much hands-on with the running of the Brickies. Sue looks after the kitchen with landlord Carl as the main chef who's harem of great girls, most of whom have been with them right from the start in 2006, look after the bar. Carl has had his health problems and in 2012 he was diagnosed with throat cancer but said "he got through the treatment with the fantastic support from family, friends, locals and of course not least Paula" and the fantastic medical staff & nurses at St Lukes at Guildford Royal Surrey. Carl & Paula have worked tirelessly to keep the The Brickies a traditional English pub that provides traditional pub food with homemade specials and an excellent selection of beers & ales. On offer to the customers are also all the old traditional games that are rarely found in pubs today; from pool, darts, shove ha'penny, bar skittles, backgammon........ it goes on! Other events include monthly quizzes, curry nights, trips to Goodwood Races and their Annual Beer Festival. The Beer Festival attracts over 700 people on the day who enjoy an all day BBQ, alarge selection of real ales from all over the country and live music all day.